Not an everyday band and not an everyday music. I think these are the most important two things when you listen Fearless for the really first time in your life. Now the four piece band gets a new single with two energetic and really really metal songs on it. On the one hand the four old american farmer styled guy is funny, a bit crazy, but on the other hand you should take them seriously when they start to play their metal..
Fearless was formed in 2005 by the Forssander brothers in a small swedish village, called Vagnhärad. The two brothers, Andy and Tobbe later step out from the garage and get other members. 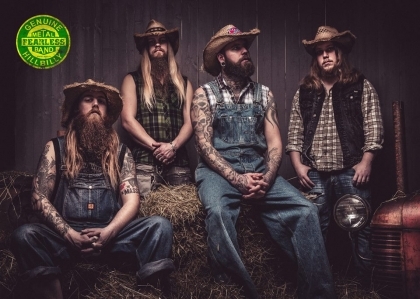 Then, after some adventures in their style and musiclife, experimenting of different genres for many years, in 2012 they found their true origin with bib overalls, lumberjack shirts and straw hats. The truth is that they somehow invented a crazy new genre: the Hillbilly Metal. Since that time, they are conquest with that all. In late December 2014 the band hit the studio to record their new thing with producer Kristoffer Folin at Purple skull media in Stockholm. The stuff was released this year, the 20th of February and are available on all the major digital stores in the internet. Their new single, Hillbilly For Life is really full with life. And strangely the harmony in it is also super weird, but in a positive way: heavy melodies, with a strange kind of funky and spinning feeling in it, spiced that all with the taste of the craziest metal parties. So i truly feel it’s something really good again in Sweden. The small virtual „disk” contains two unforgettable songs, but of the two my special favorite is Booyah. Anyway.. listening this band, it is just amazing: how the passion of the metalmusic and the country heart is melting together here. So just listen, say metal and dance with them. That is the best what you can do, and love the Fearless!